EAST LANSING, Mich. – When trace elements rise to toxic levels, bad things happen. Patients suffering from Alzheimer's and Parkinson's disease harbor significantly higher levels of zinc and iron in their brains than healthy patients. Those with pancreatic cancer have an unusually high amount of a specific zinc transporter. So, controlling those levels could be an effective plan of attack against these diseases and others, said Jian Hu, Michigan State University biochemist. 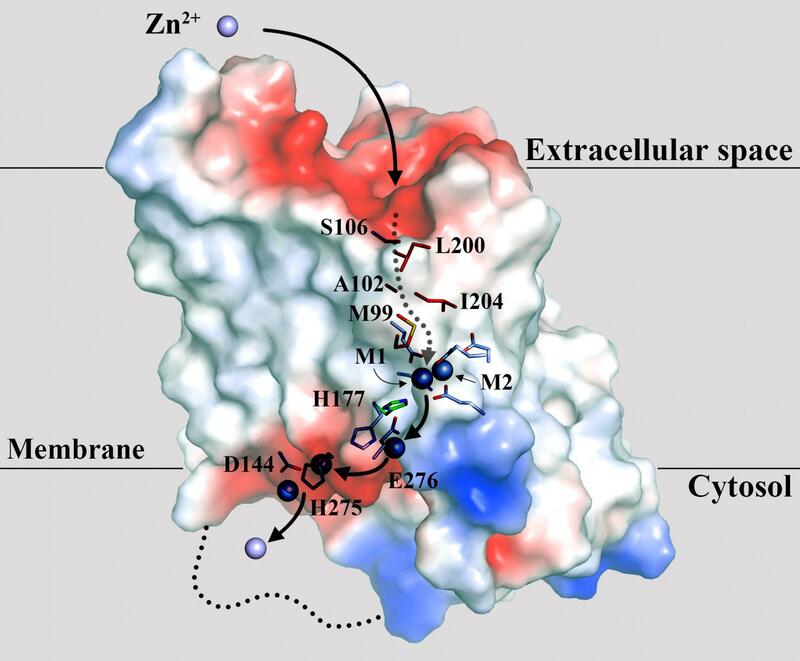 Hu and a team of MSU scientists have revealed a key structure of a molecular machine, a ZIP zinc transporter. Mapping the core of a bacterial ZIP – another celebrated first by Hu's lab – exposes its framework and mechanisms that are common in the ZIP family consisting, which comprises thousands of metal transporters. "ZIP4 is aberrantly overexpressed in pancreatic cancer cells, but it's not present in normal pancreatic tissue," Hu said. "This, and knowing that ZIP4 mutations also lead to a lethal genetic disorder, makes ZIP4 a prime drug target that could possibly help patients suffering from many diseases." The genetic disorder, Acrodermatitis Enteropathica, is a rare but lethal condition caused by severe zinc deficiency. An earlier discovery by Hu's lab revealed the exterior of ZIP4's structure, or its extracellular domain, which functions as an accessory that makes the machinery more efficient. "But without knowing the structural information of the core, we don't exactly know how the accessory works," Hu said. "We now see that the transmembrane domain is the core of the machine conducting zinc transport." The team's structure reveals an unprecedented fold for membrane transporters, implying a unique transport mechanism. "This distinguishes the ZIP family from any other known transporter family," Hu said. Solving the crystal structure also led to a surprise finding. Examining the molecular architecture revealed two metal ions trapped halfway through the membrane, forming a binuclear metal center. "It is quite unusual because it resembles the catalytic centers of some metalloenzymes, but apparently the ZIPs are not enzymes," Hu said. "Clarifying the function of the binuclear metal center is one of our primary goals in future studies." Hu has dedicated much of his career studying zinc and other trace elements, as they are essential for life. Zinc is the second most-common trace element behind iron. By deciphering how the body maintains proper levels and exploring the effects when those elements go awry, he's hoping to unlock the mechanisms of human ZIP's secrets in their many critical roles. "In the long run, we hope our study will contribute to the discovery of the ZIP inhibitors for pancreatic cancer and other devastating diseases," Hu said. Additional MSU scientists who were part of this discovery include Tuo Zhang, Jian Liu, Matthias Fellner, Chi Zhang and Dexin Sui.